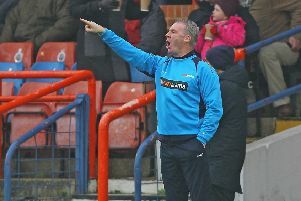 John Sheridan had to be prompted for his views on a particular refereeing decision on Saturday, but he was in no doubt as to his opinion. Chesterfield should 'definitely' have had a penalty for Barrow keeper Joel Dixon's challenge on Curtis Weston in the second half, according to the Spireites boss. Barrow keeper Joel Dixon, left, was involved in a controversial incident during Saturday's game. He didn't mention the incident in his initial summing up of the game and his side's performance. But when questioned about it, Sheridan was very forthcoming, albeit philosophical. "Definitely,all day long. We can see it, I'm 60, 70 yards away," said Sheridan. "Decisions sometimes they go for you and sometimes they don't. "I've seen it many a time given." Referee Tom Reeves waved play on, incensing Weston and a few of his team-mates. Later on in the game Reeves sent Barrow's Lee Molyneux off for a second bookable offence. Barrow boss Ian Evatt said he felt Molyneux's first yellow card was soft, but the second one was correct.